The holidays are upon us, and Black Friday is just the start for the busiest shopping season of the year. According to a National Retail Foundation (NRF) survey, holiday retail sales in November and December are expected to increase between 3.6 and 4 percent for a total of $678.75-$682 billion, up from $655.8 billion last year. This is further confirmed by Deloitte’s 2017 Holiday Survey, which mentions that about 80 percent of consumers expect to spend the same or more this holiday season as they did last year. To prepare themselves for this season, retailers need to understand their consumer base well – what they buy, why they buy and how much they spend. Consumer behavior has driven retail strategies for decades, and it will continue to do so moving forward. Their preferences of online versus in-store, mobile showrooming and an expectation of a good shopping experience are just some of the prevalent trends businesses need to be aware of, but the underlying expectation of an omni-channel strategy is leading both consumers and merchants to a new era in retail. Consumers are already experiencing omni-channel shopping and customer service in many verticals including retail. Consumers today are booking hotels online, ordering food from their favorite restaurant via a smartphone and even buying merchandise form vending machine inside the retail store. Naturally, they’ll expect similar conveniences and enhancements everywhere they shop. According to Deloitte’s survey, online holiday shoppers would prefer a store pick-up instead of getting merchandise delivered at an additional cost. Walmart, for example, has taken note of this trend and is also offering its customers a discount if they choose to pick in store. A recent Retail Dive article also highlights that Millennials are showing increased interest in purchasing options that leverage multiple channels, such as ship-to-store and online ordering from inside the store. Many other merchants are already offering these conveniences and others are expected to follow suit in order to thrive in this competitive market. According to PwC’s Total Retail 2017 report, many big retail stores are already investing in omni-channel strategies. For example, Nordstrom has vertically integrated brands such as Bonobos, Madewell and J. Crew, Saks Fifth Avenue has launched stores in Manhattan that mimic its website layout and electronics retailer Best Buy has built a new business of bespoke retail technology assistance, which allows customers to make self-service purchases and receive products at automated kiosks. They have even implemented unattended solutions across in locations such as airports and train stations, where consumers can easily buy small ticket items such as a phone charger, headphones, etc. 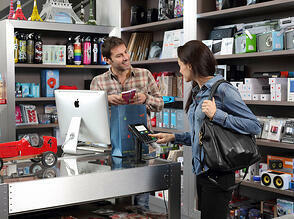 Best Buy is also looking to implement an in-store mPOS strategy to better serve every customer preference. Before the Internet was created, consumers relied heavily on shopping in brick-and-mortar stores. Now, with wide access to eCommerce, consumers are able to shop online for virtually anything. Online sales have risen dramatically over the last few years and are projected to increase further. This success of eCommerce has also led merchants to believe that consumers prefer online as their primary method for retail shopping. However, Deloitte’s holiday survey reports that brick-and-mortar mass merchants still remain one of the top two destinations for consumers when it comes to holiday shopping. Out of the two channels consumers prefer for retail shopping, their choice largely depends on the product category. 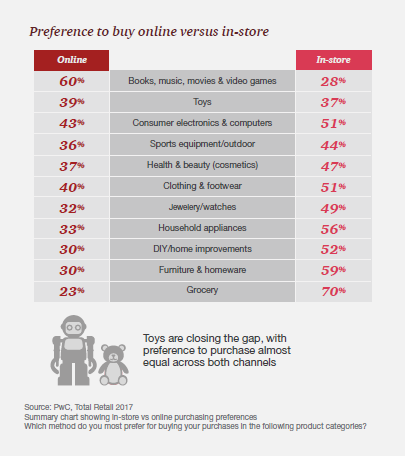 According to PwC’s Total Retail report, online shopping dominates when it comes to items like books, music, movies, video games and toys. However, for categories such as consumer electronics, sports/outdoor equipment, cosmetics, apparel, jewelry, appliances, furniture and groceries, more consumers prefer shopping in-store rather than online. This is an important reason for retail businesses to gain a better understanding of their customer base to help decide what retail strategy will work best. An effective omni-channel strategy will allow retailers to reach and serve consumers through multiple channels including mobile, online, unattended and in-store. But they will only be useful if the consumers in the market are using those channels to shop for that specific product category. 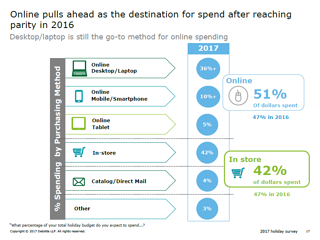 Smartphones and tablet devices have changed the face of how people shop today. Searching and browsing for items on a smartphone—while inside a physical retail store (also known as showrooming)—has become common. In many instances, these shoppers are also buying products instantly on their phones. 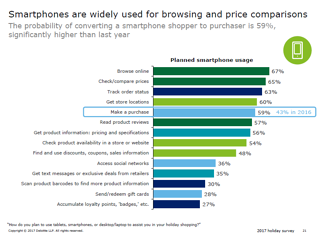 Deloitte’s report notes that smartphones are widely used in-store for browsing products and comparing prices. In fact, the probability of converting a smartphone shopper to a purchaser is 59 percent—a significant jump from 43 percent in 2016. Mobile is an important element of an omni-channel strategy, and it could also be an initial step for any retailer getting started with this new approach. With an mPOS strategy in place, retailers can serve customers wherever they are in the store, making it easy to look up pricing options, styles and other product information. This ensures that the customer stays engaged with the brand rather than seeking out information from competitors sites.  Retailers can also think about implementing innovative technologies such as Connected Screens that enables merchants and/or their advertisers directly engage with the customers via their mobile devices. By engaging with consumers on a channel outside of the store, merchants can further build brand loyalty, create impulse purchases and potentially boost profits. While the holiday season will come and go, the retail shopping landscape will continue to move forward. As it becomes increasingly competitive, consumers will expect to be able to conveniently shop and pay for merchandise on multiple channels, including in-store, online, mobile and even unattended solutions. A key to meeting these expectations is a well thought out omni-channel strategy with an integrated payments infrastructure that allows shoppers to start their purchase on one channel (such as mobile) and finish it on another (in-store)—all with a seamless experience. It’s important to remember: it’s not just about being present on multiple channels, but finding the right balance between them that works for your business. What sort of innovations are you considering adopting in your retail business this holiday season? Share your comments below, or if you’re looking to get started with an omni-channel strategy, drop us a line.